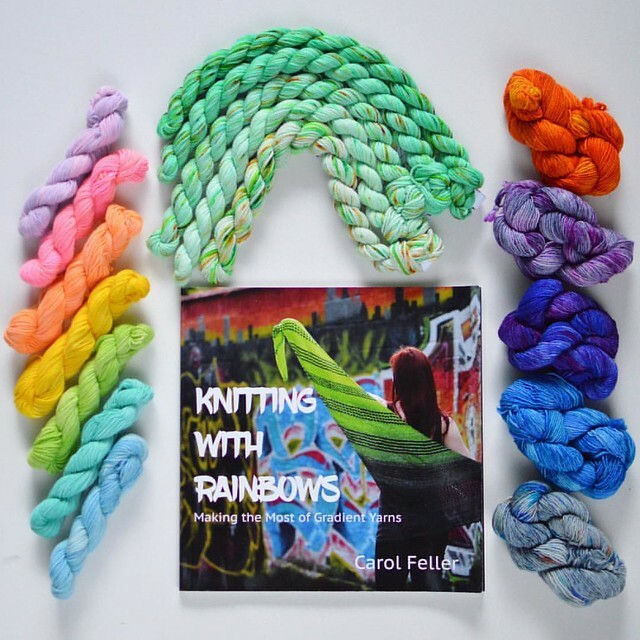 For months now, I’ve been wanting to write a blog post about Carol Feller’s Knitting with Rainbows. If you’ve not checked this book out and you are into gradient or colorful knitting projects, watch this video. Carol’s book is a colorful inspiration with practical patterns for using all those gradient yarns, hombre kits, and mini skeins that are in every local yarn store these days. What I love about the 11 Knitting with Rainbows patterns within the book is that they work equally well with solid yarns as they would with purpose-dyed gradient kits, and anything in-between. We all have spare leftover yarns and mini skein in smaller quantities/lengths that still have woolliness yet to give, but not quite the right project. Well, as you know from my Leftie post, I love patterns which help yarn fulfil their creative destiny. But I also love an excuse to buy new yarn, so Knitting with Rainbows hits that sweet spot in which I can be practical or indulgent. To get in the spirit of the book, I am listing the 11 patterns then I’ll show you which one I will be knitting first. I chose to knit the a shortened version of Arch Lane because I love the texture of it. Choosing the yarn was made easier by looking through existing projects to see results from different yarn colors and approaches, but by no means actually easy. I’m casting on the swatch this week, which is what inspired me to share my thoughts on the book. I’ll keep you updated and check out my Instagram for more crafty updates. Maybe Carol Feller’s Knitting with Rainbows will inspire a birthday gift for yourself or someone you love. Seriously, gift givers, a nice knitting pattern book and corresponding yarn make a perfect present. Toss in some adorable stitch markers and pat yourself on the back. This entry was posted in Knitting Books and tagged carol feller, gradient.